Bono, who has been recovering from a serious bicycle accident, did not attend the annual Christmas eve busking on Dublin's Grafton street this year, but was spotted with Shane MacGowan outside The Cliff Townhouse on St Stephens Green. Bono's wife Ali Hewson as well as bandmate Larry Mullen were accompanying him. Bono's left arm was in a heavy cast. Check out a photo here and here. It seems Bono is capable of annoying people even when he's not there. Belfast residents have complained about the disruption caused by filming for a U2 video in the Village area of the city and there have been accusations the Irish rockers are "cashing in" on the Troubles. A number of people living in Olympia Drive raised concerns about the shoot, which took place over several hours yesterday. One man claimed cars on set had stopped social care workers parking next to the home of an elderly couple and a business owner said it was stopping people from parking at her premises. Footage was also shot in the New Lodge area of north Belfast on Wednesday afternoon. None of the band were in Belfast for the shoot and body doubles were used. Continue reading U2 video shoot in Belfast caused disruption and was in poor taste, say residents. Accumulated losses at U2's main Irish firm increased by over €2m last year to nearly €10.5m. New figures for the band's Not Us Ltd show that the firm plunged further into the red, with accumulated losses going from €8.35m to €10.49m in the 12 months to the end of December last. The firm is being supported by Bono, The Edge, Larry Mullen Jr, and Adam Clayton, who provided a directors' loan of €2.25m last year. A note attached to the accounts states that the directors' loan attracts an annual interest rate of 3% per annum. The figures, recently lodged with the Companies Office, show that the cash pile at the band's firm last year dropped from €545,706 to €160,196. Continue reading U2 see company losses top €10.5m. LOS ANGELES (Dec. 9, 2014) - A triumph in ticket sales, U2's iNNOCENCE + eXPERIENCE Tour 2015 is sold out in multiple cities throughout Europe and North America it was announced by Live Nation. Following overwhelming fan demand, including a record-setting 118,000 fans queuing online to purchase tickets in New York, two new shows have been confirmed in New York, Boston, Montreal, Amsterdam, Stockholm, Berlin & Paris. Tickets for the new dates will go on sale Monday, Dec. 15. Additional Dates below. All dates on our Tour page. Barcelona dates go on sale this morning. Continue reading U2.com: 'DUE TO OVERWHELMING DEMAND...'. Below is the official press release from Live Nation who is sponsoring U2's forthcoming iNNOCENCE + eXPERIENCE tour starting in 2015. FOR IMMEDIATE RELEASE --- The dates for U2's upcoming iNNOCENCE + eXPERIENCE Tour 2015 have been announced today by Live Nation. The iNNOCENCE + eXPERIENCE Tour, which begins in 2015, will see U2 play indoor arenas for the first time in a decade and will visit 19 cities worldwide during its first year with pairs of shows in each city. A complete tour itinerary is below. Tickets for all shows will go on general sale on Monday, Dec. 8. In addition, special shows are being planned for Dublin for the end of next year - to benefit the U2-initiated Music Generation project - details of which will be announced as soon as they are finalised. The tour follows the recent release of U2's thirteenth studio album Songs Of Innocence by Island Records, which was given to U2.com subscribers and gifted by Apple to over half a billion iTunes Music Store customers worldwide. To date, Songs of Innocence has been streamed 81 million times and has been downloaded by 30 million fans. "We are going to try to have a completely different feeling from night one to night two," said Bono , "and have some fun playing with the idea of innocence and experience. More to be revealed!" Continue reading U2 Ticket Information for "iNNOCENCE + eXPERIENCE" Tour. As U2 announces a sizable North American tour for 2015, guitarist The Edge is confirming that Bono, who recently injured himself in a bicycle accident and has been out of commission since, is going to be just fine by then--even though he may have to miss some appearances in the process, including KROQ's Almost Acoustic Christmas later this month. The rocker called in to CBS Radio station KROQ's Kevin & Bean Show this morning (Dec. 3) to discuss the incident, as well as the tour. "He managed to come out of it with what you could only describe as injuries from a car crash, literally, multiple fractures of bones in his elbow and in his back," The Edge said. "But he's doing OK."
Don't worry--though his injuries, which included multiple fractures (chiefly a facial fracture affecting the orbit of his eye and a humerus bone fracture in his left arm that tore through the skin), may have been severe, at least he was wearing a helmet. Continue reading The Edge Says Bono 'Basically Can't Move' for Next Few Months After Bike Accident. U2 will hit the road in support of Songs of Innocence next year when they embark on the Innocence + Experience Tour, which will find the rockers visiting 19 cities throughout North America and Europe. "We are going to try to have a completely different feeling from night one to night two and have some fun playing with the idea of innocence and experience," Bono said in a statement. "More to be revealed!" The Innocence + Experience Tour kicks off May 14th with a pair of shows at Vancouver's Rogers Arena, giving Bono ample time to recover from his recent "horrific" injuries. The jaunt will also mark the first time in nearly a decade that U2 plotted a tour of indoor arenas, which will give the audience a more intimate setting to hear the band perform Rolling Stone's Number One album of 2014 live. "I think we will start small. We certainly can't get any bigger than the last tour," the Edge recently told Rolling Stone of U2's tour plans. The name of the tour also suggests the band might reveal some tracks from their planned Innocence follow-up Songs of Experience. Continue reading U2 Detail 'Innocence + Experience' World Tour. For the thousands of people crammed into the center of Times Square on a rainy Monday evening, it must have seemed like a surreal dream inspired by a night gorging on junk food, Born to Run and The Joshua Tree. U2's the Edge, Adam Clayton and Larry Mullen Jr. played the familiar opening notes of "Where the Streets Have No Name," but Bono was nowhere in sight. Instead, out walked Bruce Springsteen in a leather jacket. Needless to say, the crowd - which didn't pay a dime for the show or have any clue it was even happening until about 2:30 that afternoon - went into complete hysterics. "I want to run!" he sang with incredible force and confidence. "I want to hide. I want to tear down these walls. . ." It was an amazing moment at a World AIDS Day (RED) benefit that came together in complete secrecy over the past couple of weeks. Originally scheduled as a regular U2 show meant to follow their planned week-long Jimmy Fallon residency, the band had to start working the phones after Bono's devastating Central Park bike injury left him unable to perform. Nobody says no to Bono, especially an injured Bono, so Chris Martin and Bruce Springsteen agreed to front U2 for the evening, joining Kanye West and Carrie Underwood on the bill. Despite everything that goes into assembling a free outdoor concert in the heart of New York City, word of the gig didn't reach the public until U2 announced it on their website about five hours before showtime. 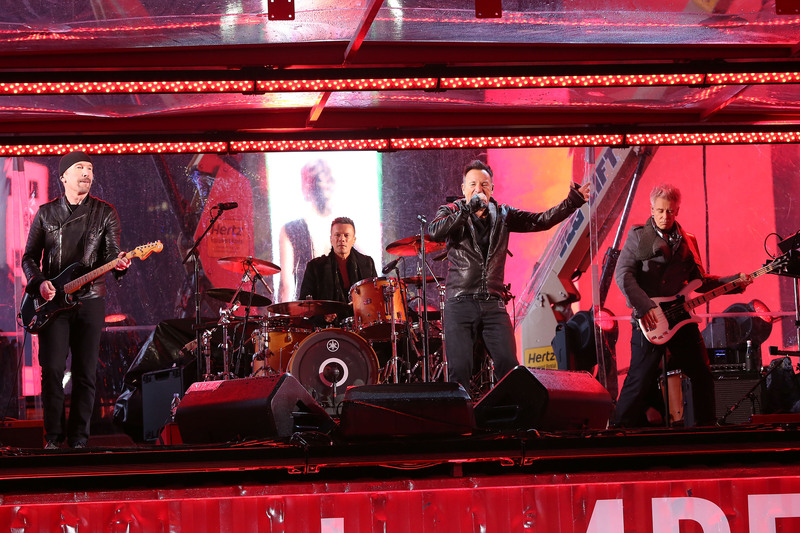 Continue reading Bruce Springsteen, Chris Martin Fill Bono's Shoes at Times Square Benefit.